Want an easy way to contribute? Check out our monthly block drive! Covered in Love is a 501(c)(3) quilting charity that provides comfort quilts to patients who pass away in the hospital. I started CiL in the Spring of 2015 with 8 quilts and it has grown and grown. 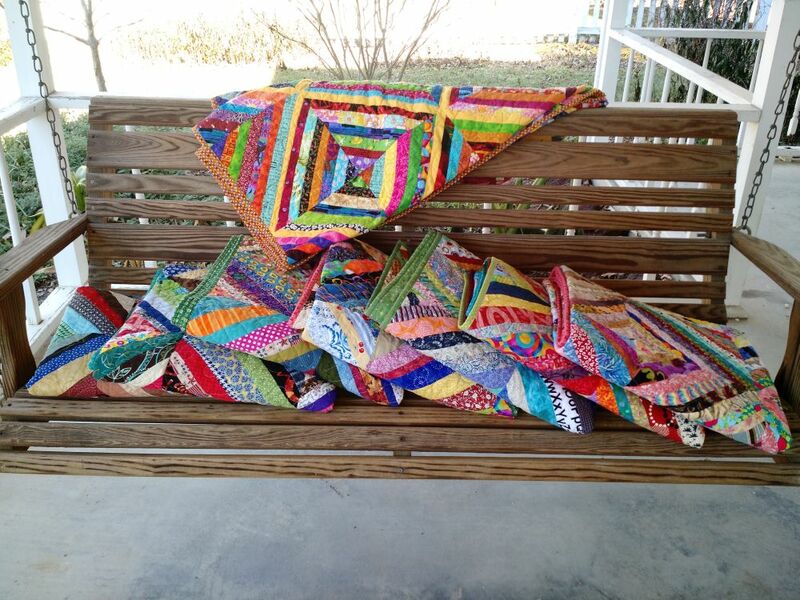 To date over 400 quilts made by over 100 quilters have been delivered to families in East Texas. Scroll to the bottom for details about how you can help. Read a newspaper article about CiL here. In my day job, when I'm not quilting, I work as an RN on a Med-Surg floor where I see a lot of people nearing the end of their lives. Heart failure, COPD, Renal disease, the kinds of things that people live with for years and years before they really start to die from them. It's rough, for the patients, families, and nurses. There are not very many good decisions to make near the end of life, mostly just difficult ones. Unfortunately, while modern medicine can often make people live longer, it often cannot make them better. When a family and/or patient makes the difficult decision to stop treating a disease aggressively and place things in God's hands, we do our best to get them moved to hospice. Tyler has a lovely hospice facility which I happen to know several area groups provide quilts to. However, sometimes the decision is made too late or the disease progresses too quickly and someone spends their last hours or days in our hospital. As nurses we do our best for these families. We get them in a private room. Steal chairs from the lobby so everyone has a place to sit. Give them the code to the coffee room. Still, it seems so inadequate to the situation. Honestly, everything is inadequate to that situation, but as a quilter my first impulse when I see a need is to fill it with a quilt. So, I'm asking you, blog world quilters at large, to please help. Covered in Love keeps a stash of quilts for our hospital so that when a person is dying as an inpatient their nurse or the hospital chaplains can deliver them a quilt. Placing a quilt on the hospital bed warms up the room and is taken home by the family as a memento and transitional object. The first set of quilts were delivered on April 1, 2015. For more posts about the project and why we do what we do you can read here and here. I posted a long update as of Sept 2016 here. 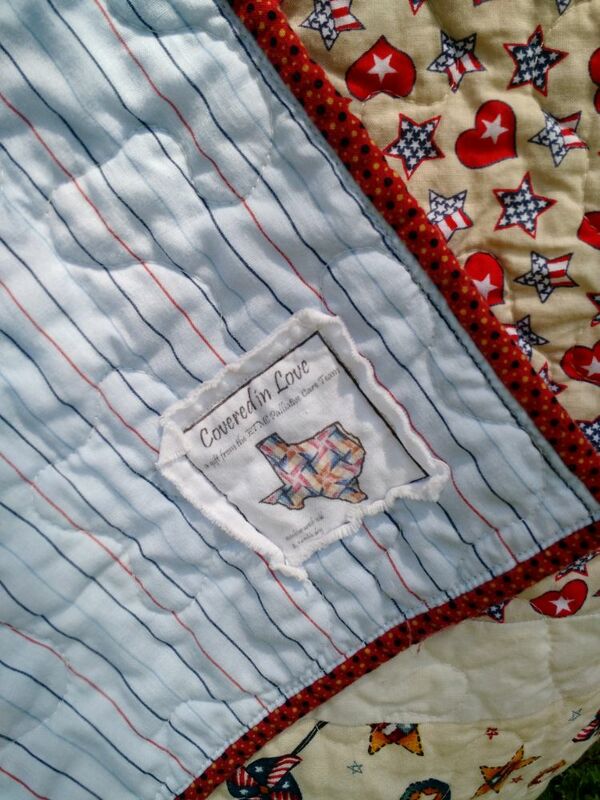 Please email CoveredinLoveTx@gmail.com or comment if you have any questions or if you would like my address to ship a quilt/top/blocks and THANK YOU in advance! Most of the donations to CiL are in the form of materials for quilting, however financial donations are appreciated as well to cover the costs of supplies, shipping, and quilting services. You can use the PayPal link above or send a check though the mail. One easy way to donate is to participate in the block drives. Every 2 months I announce a new block tutorial. Participate in the drives you like, skip the ones you don't, and make as many or as few blocks as you want! Click for details HERE. 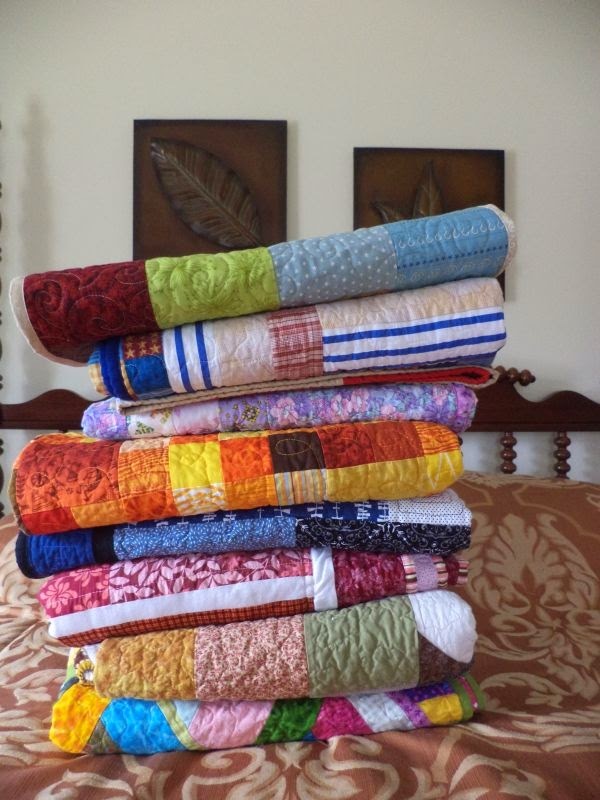 CiL gladly accepts donations of finished quilts, unfinished quilt tops or blocks, and supplies such as batting and fabric suitable for quilt backings. Long arm quilters wishing to donate their services are also appreciated. We are a 501(c)(3) and I will happily provide you a tax receipt. Quilts need to be at least 45"x60", so they can be used by the families as throw quilts after they are home. 50"x70" is the ideal size. Almost all our quilts are given to adults so please keep that in mind when choosing fabrics. Quilts needs to be machine wash/dry safe! Hospitals are NOT clean places so at the very least the quilts need to be washed once when they are taken home. I have been in various circumstances where it has been the nurses who have been Angels on earth for me. I would like to contribute by making a quilt for you. Bless your heart for what you are doing to comfort both patients and families. Please send your address to me at kthom300@yahoo.com. The patients and their families at ETMC will have their final days changed forever because of you and your charity. Anyone can sit in a classroom, endure clinicals, and study hard enough to pass their boards. But it takes heart & commitment to truly be an RN... nurses like you are the ones that really do make the difference! Kat, I have four blocks ready to send for the October's block but I misplaced the address you sent me previously. My emails is: jmshelley1@yahoo.com. Thanks for all your hard work making these quilts. 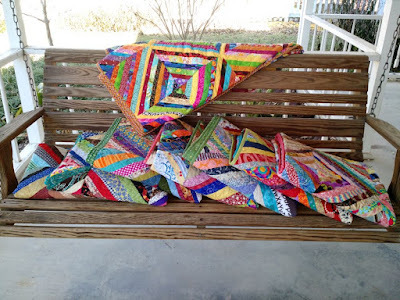 Kat, I host a charity quilting challenge each year called Hands2Help (on my blog, Confessions of a Fabric Addict.) Someone suggested your charity as one of our featured charities for 2016, and I'd love to discuss it with you! Please email me at salliesue57 (at) gmail (dot) com as soon as possible - I'm preparing for this year's challenge right now! Kat, So wonderful of you to find this need and fill it. I am still healing after extended illness and 2 month hospital stay, and learning to quilt again. You can bet I will be making a donation quilt for you. Just found your site thanks to a friend. I'm looking forward to helping you with monthly blocks when I can. Blessings to you and the comfort you provide the families by distributing these quilts of love. I live in Austin and would love to join the block group. Please let me know how. My email is mmjte1990@gmail.com. P.S. I referred my mother-in-law, Polly Eriksen to your charity. I understand she has contacted you and is very excited to be a volunteer. Thanks, Julia E.
Visiting from Sarah's Hands2Help, just wanted to tell you that your charity work is wonderful. Here in western NC we do quilts for the local hospice. I have been an NP for 15 years, good luck with your studies!! Kat I have sent a couple of e-mails with questions. Can you check your spam?